Here I am – sitting cross-legged in my tent, the darkness filled with the glow of the computer screen. 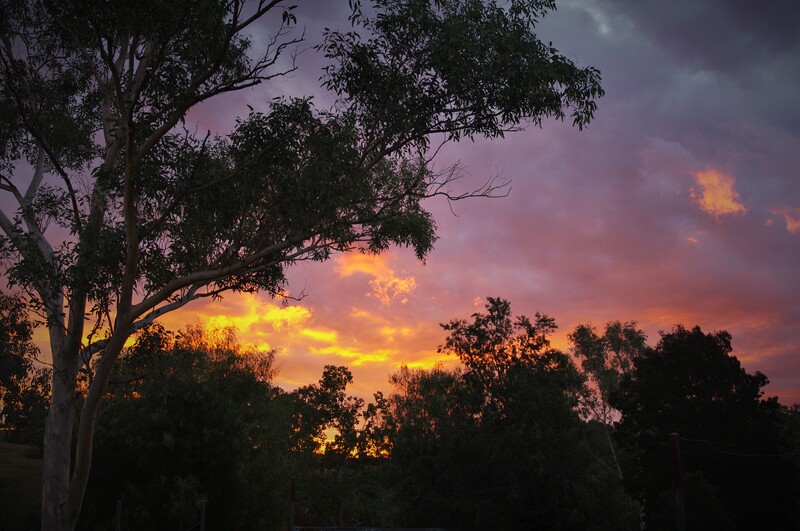 I am camped in an open-sided shed at the Gundy Showground – a small bug crawls across my writing, outside something is moving on the tent. I’m sharing the shed with a couple who are riding the Bicentential National Trail. They’ve been taking a break here in Gundy this week and spent the afternoon re-shoeing two of their five horses. They began at the northern end of the trail up in Far North Queensland a year ago and hope to finish by Christmas. It’s been a day of moments. It had rained overnight in Scone and more threatened through the morning as we breakfasted, wandered about and I avoided getting on with it. Around midday Jim drove me to the turn off for Gundy. I loaded my bicycle as rain began to fall. My heart raced with an undefined panic. I breathed deeply and cried some. With a big hug and assurances that he, and all my mates, are only a phone call away he encouraged me to get on my way. And I did. I got on my bicycle and pedalled down an unfamiliar road. The bigness of the plans creep in around the edges sometimes and knock me over a bit. Otherwise I’m pretty good at just thinking of it as doing one thing at a time – today I went for a ride from Scone to Gundy. Simple. The road was good, the motorists all polite – though, yes, it is scary to hear a car coming up behind you on a small-ish country road. All I can do is hold my line and think: see me, slow, pass wide, please. The countryside here is beautiful – soft rolling hills, horses in paddocks, bigger mountains (in the Australian sense) further off. 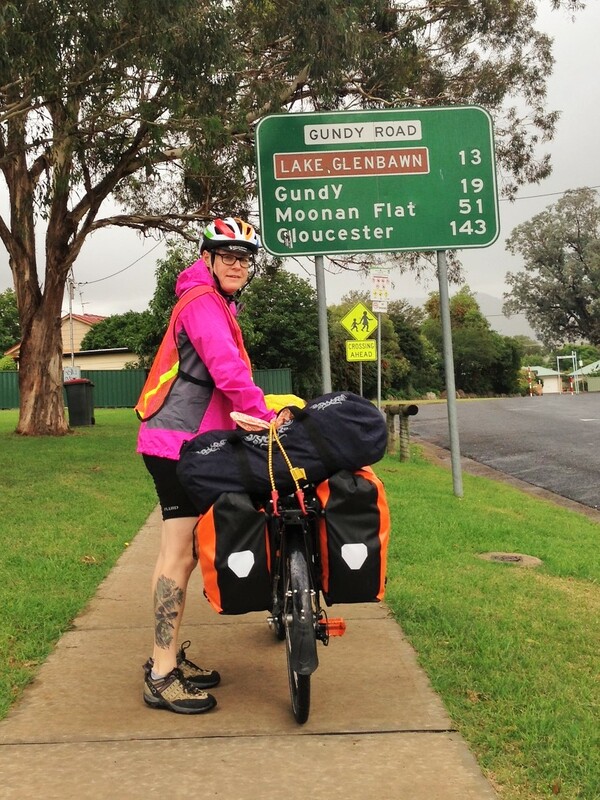 The ride was just 20 kilometres – in less than two hours I was rolling into Gundy: a pub, a general store, a church with two services a month and a scattering of houses. Once I’d set up camp and had a shower I was then faced with the moment I had anticipated … I had nothing to do and nowhere to be. I chatted with my neighbours and watched them shoe their horses. I walked back down to the general store and ordered a pot of tea. I sat on the veranda watching passing traffic and wrote. Back at camp I edited photos then admired a flaming sunset. My neighbours having a car during this week long break went into Scone to get dinner and I made Korean instant noodles. They had come the way I am going and suggested a nice spot to camp just before the climb to the Crawney Pass. It would save me the extra riding to get to and from Timor Caves. For all intent and purposes both spots are functionally wild camping. It will be dark for nearly 12 hours and I will be alone. I had a few moments there – squatting on my tarpaulin, hunched over my pot of noodles, in this shed in Gundy – where I wept a little and questioned whether I can do this. I wanted to talk to my friends but there’s no mobile reception. I’m scared about tomorrow. I don’t think any misfortune will befall me but it’s going to be a challenge, emotionally – to be out there alone like that. I don’t actually want to do that. I wish, a little, I hadn’t chosen this route with such a tough couple of days to start with. Maybe if I start early enough I can make it all the way to Nundle – which is like 80 km including this climb at 55 or so. One step at a time. Ride to the Timor Caves turn off and decide then what to do next. Reblogged this on Elizabeth Everett Cage. You are amazing! Such hard work. I’m really looking forward to reading about your adventures. You’re ready for this. If you haven’t already read Wild by Cheryl Strayed, you might really enjoy it. Her journey was different than yours, and you’re WAY more prepared than she was. Despite the obvious differences though, you might see some of your story in hers. Thank Ellen! I’ve not yet read Wild but am sure too soon. I saw the movie and have heard many good things about it.